Every pilot should experience the glories of a cross country adventure in a flock of small planes. Days are spent in your plane with your flying buddies just off your wingtip. Together you hopscotch from place to place, taking in new sights, meeting new people. Together you deal with whatever issues arise. Each morning when you wake up you know where you are but you don't know where you will be that evening. Weather, wind and whatever will determine your route and schedule. Flexibility is paramount. You must be fluid and go with the flow for you can't win a battle with nature. You bond with your plane - each time you put it on you morph into a cybernetic organism with the power of flight. You bond with your companions - the sharing enhances the experiences far beyond going alone. 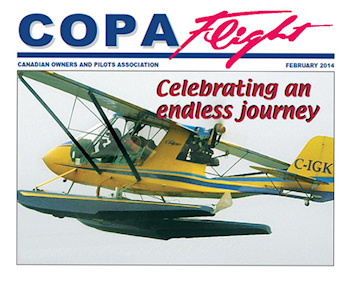 In 1999 an intrepid group of voyageurs from Ontario and Quebec headed north for an eight day, 2,000 km trip in their amphibious Challenger ultralights. This was the first of what has become the Annual Challenger Float Tour. Flocks of Challengers have since explored the majestic fjords of the Saguenay, the rugged shores of Lake Superior and the sand beaches of Lakes Huron and Michigan. They have ventured east to the Atlantic and migrated south to the Gulf of Mexico. 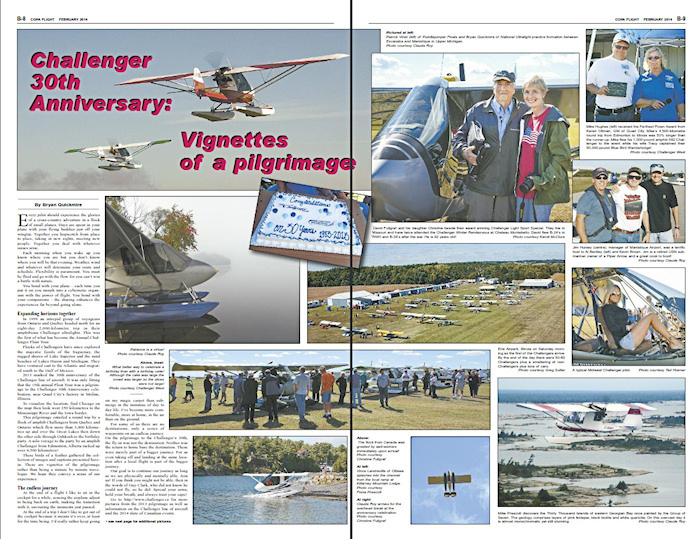 2013 marked the 30th anniversary of the Challenger line of aircraft. It was only fitting that the 15th annual Float Tour was a pilgrimage to the Challenger 30th Anniversary celebration, near Quad City's factory in Moline, Illinois. To visualize the location, find Chicago on the map then look west 250 km to the Mississippi River and the Iowa border. 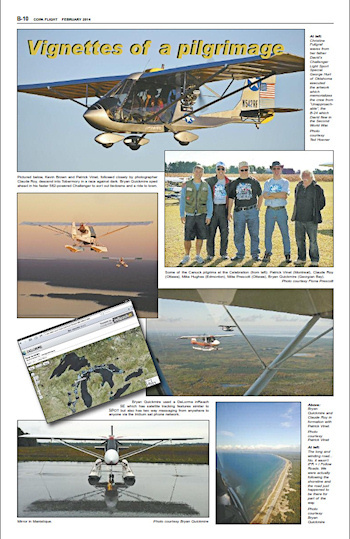 This pilgrimage entailed a round trip by a flock of amphib Challengers from Quebec and Ontario which flew more than 3,000 km up and over the Great Lakes then down the other side through Oshkosh to the birthday party. A solo voyage to the party by an amphib Challenger from Edmonton, Alberta racked up over 4,500 km! These birds of a feather gathered the collection of images and captions presented herein. These are vignettes of the pilgrimage rather than being a minute by minute travelogue. We hope they convey a sense of our experience. At the end of a flight I like to sit in the cockpit for a while, sensing the airplane adjust to being back on earth, making the transition with it, savouring the moments just passed. At the end of a trip I don't like to get out of the cockpit because it means it's over, at least for the time being. I'd really rather keep going on my magic carpet than submerge in the minutiae of day to day life. I've become more comfortable, more at home, in the air than on the ground. For some of us there are no destinations, only a series of waypoints on an endless journey. On the pilgrimage to the Challenger's 30th, the fly-in was not the destination. Neither was the return to home base the destination. These were merely part of a bigger journey. For us even taking off and landing at the same location after a local flight is part of the bigger journey. Our goal is to continue our journey as long as we are physically and mentally able. Join us! If you think you might not be able, then in the words of Guy Clark, who did not know he could not fly, so he did: Spread your arms, hold your breath, and always trust your cape! 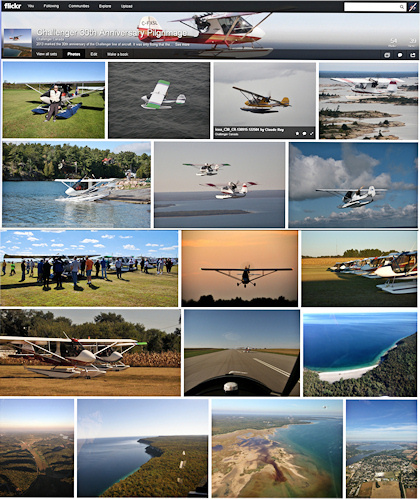 to our new Challenger Canada Photo Albums site on Flickr. the people as well as the overall experience and the incredible variety of scenic delights!